Valerie Hegarty s installations create dream- like transitional spaces that expand and fracture the austerity of an exhibition space while dismantling the constructs of image making. For her first solo exhibition in New York, Hegarty will present Landscaping, a new installation in which an idyllic woodland scene, seemingly alive and growing, overcomes the gallery in a collision of exterior and interior views. 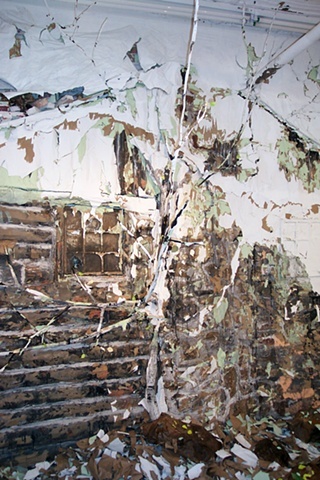 Working solely with paper and paint, Hegarty exploits a scrupulous mimicry of all of the elements of Landscaping- the ladder left in midst of an attempted repair of the situation, the trees, the cabin- that can render the viewer into a state of euphoric confusion. On one level the viewer can become overwhelmed with an inquisitive desire to determine what is real and what is constructed and on another, reveling in the make believe  they may wish to remain in her escapist fantasy of secret forests and hidden lands forever.